When I first looked at the pre-season schedule a few weeks ago, I thought that–given our history–SAC was the one we might most easily drop. 8-0 in the preseason doesn’t mean anything, but I would like 8-0, just for the sake of 8-0 and perfection. We were ON. Sure, there were times when we were still too jump-shot happy or could have been more focused, but I don’t think we could be going into the regular season on a higher note. This one was just beautiful. Everything and everyone was just clicking. It’s hard to single anyone out, but of course I’m going to start with AK, who was all over the place and doing it all (9-7-2-3-2). I don’t put much stock in +/-, but Andrei was +17 and no one else on the team was more than +7. 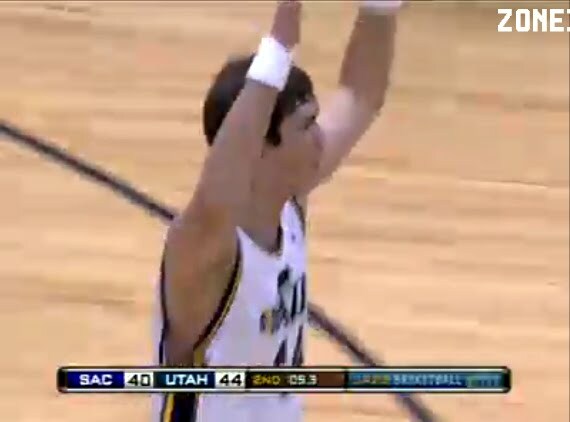 Tonight, we also saw why the Jazz signed Elson–he was drawn to SLC by Jerry’s Bat Nasty signal. We’ve now got our very own Nasty Dutchman in the Paint, and I love it. Raja was considered doubtful for tonight due to shoulder issues, but he said that he wanted to play because he felt like he was getting into a good rhythm. While he was 3-9 overall, all three of his FGs were treys and he did what he does–without any sort of shoulder support/padding/sleeve. Toughness FTW. The closing lineup was crazy–Watson+Price, Hayward, Elson+Fes. And you know what? It was great. It worked. We won. 8-0. Last thing: Fes told a story pre-game about how Jerry was telling the players at practice to stop “jackpotting around.” He had no idea what it meant, so he went home and googled it. As told on KFAN during the pre-game show and by Brown&Booner during the game broadcast, the urbandictionary.com definition for “jackpotting around” is the first result that comes up when you do a google search. And how does urbandictionary.com define “jackpotting around”? I would’ve bet good money that Jerry Sloan would be the last person on earth to be referenced on Urban Dictonary. Just shows how much I know.